What follows is a very on point 3 minute explanation of the current world malaise and how to stop it. Made in the U.K., this message cuts through all of the current B.S. that is warping people’s perceptions about schools, teachers, unions, and the like. Stock futures are close to even this morning with the dollar down sharply, bonds lower, oil is sharply higher, gold is rising, and most food commodities are slightly lower. Note how there always seem to be some commodity that is being ratcheted up, even if others are correcting. A Forbes article this morning is again warning of $4 gasoline coming soon. Stocks in Europe are lower with the financials under pressure as it appears that the flow of interbank funds could be drying up again. Hard to trust one another when you know how insolvent each really is. Stress tests my rear – might as well let the marketing professionals run the world. Oh wait, they do. NEW YORK (CNNMoney) -- Federal Reserve Chairman Ben Bernanke said Friday that unbalanced flows of money between nations is again posing a risk to the global economy and financial stability. Speaking in Paris to a Bank of France conference, the Fed chairman said the uneven flow of funds into the United States from 2003 to 2007 was one of the key factors that led to the meltdown in financial markets in 2008. He did not say the current flow of capital poses a threat of that magnitude. 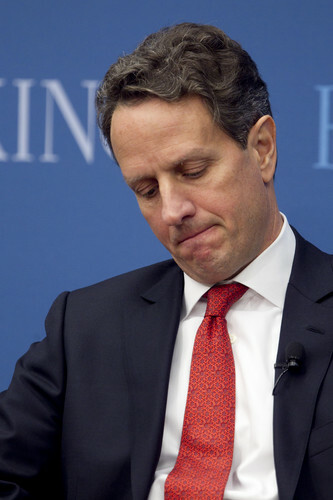 But he warned that while the global financial crisis is receding, "capital flows are once again posing some notable challenges for international macroeconomic and financial stability." Bernanke did defend the Fed's controversial program to buy $600 billion in U.S. bonds, known as quantitative easing. Some argue that the purchases, dubbed QE2 since it is the second round since the onset of the financial crisis, is feeding rising global inflation. Bernanke argued that the U.S. economy still needed more support and that the inflation pressure was coming from countries that are keeping their currencies undervalued rather than from the Fed's efforts. "Resurgent demand in the emerging markets has contributed significantly to the sharp recent run-up in global commodity prices," he said. "More generally, the maintenance of undervalued currencies by some countries has contributed to a pattern of global spending that is unbalanced and unsustainable." Oh please. Now he sees trouble? But of course none of it is his fault. And rising dollar quantity around the world equals “growth” in his warped mind. A month-to-month swing in building permits made for sharp volatility in the index of leading economic indicators where growth slowed to 0.1 percent in January vs 0.8 percent in December (revised down from 1.0 percent). Building permits were the leading contributor to December's index but subtracted the most in January. Permit volume was affected by changes in laws in some localities. In a more telling sign of trouble, the second most negative component was initial jobless claims which, based on the weekly report posted earlier this morning, don't look to be of much help for the February LEI. January's biggest contributor is the yield spread reflecting low front rates and what have been rising long rates. A slowing in deliveries was the second biggest indication of future economic strength followed by the stock market and by consumer expectations, the latter having shown tangible improvement so far this year. Other data include a marginal 0.1 percent gain for the coincident index which unfortunately points to a slow start for the first quarter. Likewise, the leading index also points to a slowing, not contraction just to slower growth which would not be a positive for the still modest outlook on the jobs market. This is a great example of how the actions of the “Fed” distorts economic data. While the “Fed” bankrupts our country with debt that is completely unnecessary, they are now forced to buy up bonds to keep their game going. They are buying the short end most heavily, thus artificially driving down short term rates. Meanwhile their reckless actions are causing rates to rise on the long end. And the LEI sees this differential as a positive to the economy as banks can arbitrage the difference. But in fact, it is a most unhealthy condition and bogus indicators like the LEI is leading dumb investors right over the proverbial cliff. Feb. 18 (Bloomberg) -- European Central Bank Executive Board member Lorenzo Bini Smaghi said the bank may need to raise interest rates as global inflation pressures mount. Bini Smaghi’s comments suggest officials are becoming more concerned about inflation, which has already breached the ECB’s 2 percent limit and is running at the fastest pace in more than two years. Companies are facing stronger input-price pressures, and forecasters in an ECB survey this month raised their longer- term inflation expectations to 2 percent. “The continued firm anchoring of inflation expectations is essential,” Bini Smaghi said in the interview, which was conducted by e-mail on Feb. 16. Uh huh. And yet countries around the world continue to print money like it can be created on a computer printer. Oh yeah, that’s exactly how it’s done. Berspankme blames China and “Emerging Markets.” China blames America. Europe blames global inflation pressures. Yet no one will stop printing. And thus the outcome is pretty much settled. Meanwhile “other events” continue to get nasty. Bahrain is a potential disaster in the making. The power between the Shiites and the Sunnis hangs in the balance, as does America’s position in the Middle East. Like Mexico turning into a bad scene from the movie “Mad Max,” thirteen more were killed in separate shootings in Juarez. Violence in Guadalajara has become so bad that Alaska Airlines will no longer overnight an airplane and crew there – they will “turn” instead. They have also been shifting flights out of Mexico. Is Mexican violence the doing of central bankers? You bet it is – they continue to support the drug trade, launder their money and sell weapons to them. Their inflationary policies create havoc on the poor and leave them little alternatives but to participate in the drug trade. The government is powerless in the face of such pressures, these are the same pressures leading to revolution in the Middle East and in Africa. And they are the same pressures that is causing states to be bankrupt and forcing Governors into boxes in which they very inappropriately blame teacher unions and attempt to pass legislation banning collective bargaining. In Wisconsin, Governor Scott Walker is getting a lesson in NATURE. You see, “collective bargaining” is a natural trait of intelligent and social animals. You can no more ban it than you can hold the people down in repression forever. Look at Egypt, collective bargaining at its finest. Not once have I heard Governor Walker or Governor Christie talk about how much money their states spend on interest each year by using PRIVATE BANKER BONDS to finance the state’s needs – debt? The interest expense enriches the private bankers, but yet the states could absolutely eliminate this expense by creating their own state chartered banks. Crickets. This is because politicians on that level or higher can only be elected by taking money from the banks. Thus they are entangled in huge conflicts of interest. That goes for nearly all politicians on the federal level. No, such efforts to place blame on unions is completely misguided – just as blaming the union for GM or Chrysler’s woes was completely misleading. The blame lies squarely on the inflationary money system foisted on the people. The bankers have saturated the globe with debt and now that debt is leaching out into all sorts of places, especially food and energy. Markets are closed on Monday, ahhh shucks, there goes another opportunity for a perfect JPM HFT POMO fueled rob the middle class and screw those on the margins narcissistic trading day. Equity futures are lower this morning, moving lower on the release of Weekly Jobless Claims and Inflation data. The dollar is slightly lower, bonds solidly higher, oil and gold are up, and most food commodities are higher. Jobless claims are not pointing to underlying payroll growth. Initial claims rose a steep 25,000 in the February 12 week to 410,000. The prior week was revised 2,000 higher to 385,000, one of only two weeks this recovery that claims have been under 400,000. The four-week average rose 1,750 in the latest week to 417,750 to show no significant change from mid-January in a comparison that doesn't point to improvement for the February employment report. Continuing claims have been coming down but only slightly and not in the latest data, up 1,000 to 3.911 in the February 5 week. The four-week average of 3.942 million is down 73,000 from the month earlier. The unemployment rate for insured workers is unchanged at 3.1 percent. In data for the January 29 week, an unadjusted total of 9.25 million Americans were claiming benefits, down about 108,500 from the prior week. Weather may be blamed for the failure of initial claims to show improvement so far this year, which does hold out hope for the weeks ahead. 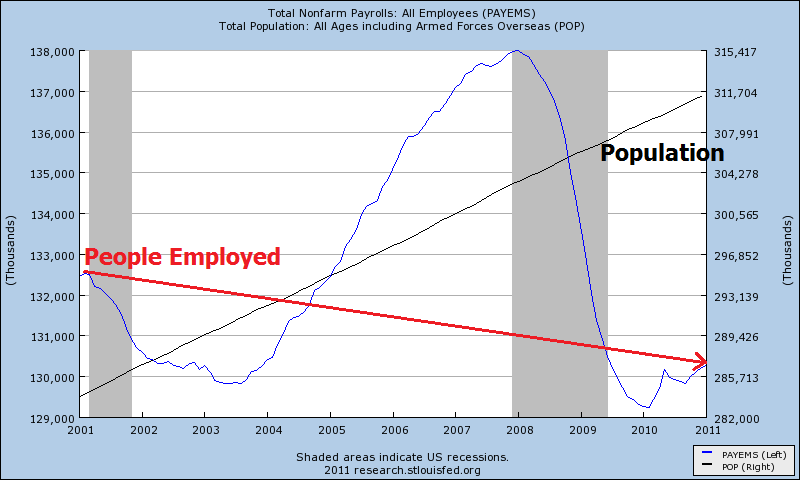 Otherwise, the jobs market remains a central risk to the economic recovery. Oh yeah, it’s the weather – weather never happens in January. The swings in these numbers are caused not by the weather, but by the seriously flawed seasonal adjustments made by the Department of Labor. Unadjusted claims were actually down from last week, but are at a horrendous level for an economy that has a “Fed” throwing trillions at its banking members. When will Americans learn that banks don’t create jobs? We need to throw the “Fed” out the window (many members belong in prison) and take back the power to create money. That is the only way true employment is ever going to increase. 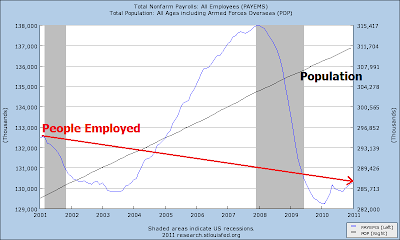 Below is a chart showing an increasing population against a declining number of people who actually have jobs. …Just inflation – that profits you know WHO. Headline CPI inflation continues its trend of outpacing core inflation-largely on strong gains in energy costs but with food price hikes also contributing. The CPI in January increased 0.4 percent, following a 0.4 percent jump in December. The consensus had called for a 0.3 percent gain in January. Excluding food and energy, CPI inflation in January posted at a 0.2 percent rise, compared December's increase of 0.1 percent and exceeding expectations for a 0.1 percent gain. By major components, energy increased 2.1 percent after jumping 4.0 percent in December. Gasoline rose 3.5 percent, after spiking 6.7 percent the previous month. Food price inflation picked up the pace to 0.5 percent from 0.1 percent in December. Hikes in energy commodities and food accounted for over two thirds of the all items increase. The firming in the core rate was led by a 1.0 percent jump in apparel and 2.2 percent boost in airline fares. Medical care commodities gained 0.5 percent. On the more moderate side, the shelter index rose 0.1 percent in January, with the rent index increasing 0.2 percent and the index for owners' equivalent rent rising 0.1 percent. Tugging down were declines in new vehicles, down 0.1 percent, used cars and trucks, down 0.3 percent, and medical care services, down 0.1 percent. Year-on-year, overall CPI inflation increased to 1.7 (seasonally adjusted) from 1.4 percent in December. The core rate rose to 0.9 percent from 0.6 percent on a year-ago basis. On an unadjusted year-ago basis, the headline number was up 1.6 percent in January while the core was up 1.0 percent. Overall, today's report shows a firming in inflation pressures and points to upward pressure on interest rates. No, interest rates can’t rise. That is not unless you wish to crash the entire debt saturated planet. Welcome to the impossible math created the day the “Fed” stole the people’s rightful ability to control the production of money. Interest expense, from that day forward, went to benefit a few individuals instead of the general good of the people. Thus our money system is not ours. Note the word “Note” printed on every bill inside of your wallet. That term denotes a LOAN, it is not money, the “Federal Reserve Bank” is not Federal, they possess no reserves when marked to reality, and they are not even a bank. And then we wonder why we have no jobs, we’re losing our homes, and what jobs we have are all menial. We have the “freedom” to pursue happiness, yet we wonder through life producing nothing of meaning, not really happy, failing to advance humanity, while we await the next shoe to be dropped – American spectator style. Quite the reality show, at least we have stolen from the Asians the technology to observe the disintegration in real time. Perhaps we can all stage a virtual sit in – somewhat Egyptian style? Of course if we all stopped our current “productive efforts” I wonder if anyone would even notice? I think that even that is understated, as food and energy have not been rebalanced appropriately to incomes. Food commodities have doubled in the past six months, the run up began not when winter weather struck, but the ramp began in earnest at the same time as QE2. The banks can manipulate gold and silver, but at the same they are pumping money and playing games with the markets and precious metals, some of their hot money began to leak into food. Now they are really boxed in. If the economy is improving, can interest rates rise? Before they rise, the assumption would be that they would stop monetizing. Yet they can’t do that or the markets they are propping up, along with the entire financial industry, will crumble. Yet if they continue to monetize at ZIRP, then food and energy do a moonshot. This is the situation THE CENTRAL BANKERS created, and I say let them eat it, as they most certainly will in the end. Stock futures are higher, keep in mind Monday’s small movement of the McClellan Oscillator. 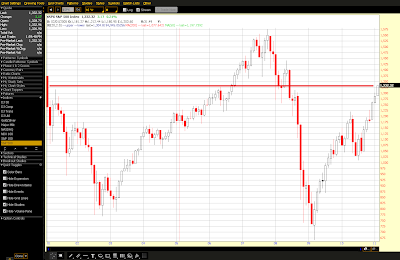 The trend here seems to be that we have a small reading, a day of consolidation and then ramp. Despite that, the dollar is spiking higher, bonds lower, oil & gold slightly higher, while food commodities are in correction mode with rice gapping down a significant amount. Funny this is occurring just as the “World Bank” issues a report stating that rising food prices have sent 44 million into extreme poverty. Naturally no mention of their role in producing hot money, it’s all about population growth and the weather. Not to mention that figure is extremely low, I’m thinking the number of people sent into extreme hardship is probably well above a billion. This is called Market capture. They ARE the market. A fact of which I’m sure the narcissists like Jamie Dimon are proud of. Yet to me this is grotesque that we have allowed this firm to become so dominate, as they use their capital and super computers to rob the real people of the world. The markets are NOT REAL. They are 100% controlled and contrived by just a few firms, JPM is the largest by far. Extreme volatility for sure, the correlation between Mark-to-Market accounting rules and the supply of POMO are the most significant correlations in the marketplace today. Should either of those change, we would absolutely see the volatility on the downside again. And this market capture has made the markets extremely vulnerable to JPMorgan’s whim. As they have grown bigger and more dominant, should any lawmaker or event threaten them, they are now carrying a bigger market stick. Sick how the people of the planet let them create money from nothing, then allowed them to create derivatives from nothing, and now we allow them to control our markets – not to mention control of our politics. Rising rates, up nearly one full percentage point from October, are drying up refinancing demand and are cutting into already weak demand for home purchases. The refinancing index fell 11.4 percent in the February 11 week to the lowest level in more than 2-1/2 years. The purchase index fell 5.9 percent. The average rate for 30-year mortgages was little changed at 5.12 percent. What’s there to say about that? A one percent move in interest rates translates into 11% less house that people can afford over the course of a 30 year loan. Housing construction was mixed in January and remained at a very soft level. Starts advanced while permits fell back. Housing starts in January jumped 14.6 percent after slipping 5.1 percent the month before. The January annualized pace of 0.596 million units beat analysts' forecast for 0.540 million units and is down 2.6 percent on a year-ago basis. January's pace is the highest since 0.601 million seen in September 2010. The latest gain was led by a monthly 77.7 percent surge in multifamily starts, following a 10.8 percent rise the month before. The single-family component slipped 1.0 percent after declining 8.4 percent in December. By region, gains in starts were seen in the Northeast, up 41.8 percent; the Midwest, up 36.4 percent; and South, up 15.8 percent. For the West, starts declined 9.7 percent. Housing permits, in contrast, fell 10.4 in January after improving 15.3 percent in December. Overall permits came in at an annualized rate of 0.562 million units and are down 10.7 percent on a year-ago basis. The latest decrease was led by the multifamily component which was down a monthly 23.8 percent while single-family permits declined 4.8 percent. Data were mixed in January with starts up and permits down. But there are two key issues. First, strength (albeit soft strength) is in the multifamily component. Homebuilders are still very cautious about the single-family sector with inventory overhang still high. Second, seasonal factors are large during winter months and it is difficult to really sort out the marginal changes. The bottom line is that housing is still anemic although some apparently are a little optimistic about the multifamily sector. Inventory is still far too high, and the upper-end homes are on the verge of a dramatic rise in the number of resetting Option-ARM loans which will place great pressure on home prices just as interest rates are rising. Key underlying detail on major components reversed position in January from December. This time a decline in utilities output masked a moderately healthy showing in the manufacturing component. Industrial production dipped 0.1 percent, following a 1.2 percent jump in December. The latest number fell short of analysts' projection for a 0.5 percent gain. January's decrease was led by a 1.6 percent fall in utilities output, following a 4.1 percent spike in December. Also, mining tugged down on industrial production, declining 0.7 percent in the latest month. In contrast, manufacturing output advanced 0.3 percent after a 0.9 percent jump in December. Within manufacturing, output of motor vehicles and parts was up a sizeable 3.2 percent, following a 0.2 percent gain in December. Excluding autos, manufacturing edged up 0.1 percent in January after a 0.9 percent jump in December. Essentially, manufacturing is continuing a healthy uptrend with some months stronger than others. On a year-on-year basis, overall industrial production slowed to 5.2 percent from 6.3 percent in December. Overall capacity utilization slipped in January on the decline in utilities and mining, easing to 76.1 percent in January from 76.2 percent the month before. The January rate came in lower than the median forecast for 76.3 percent. Volatility in the utilities component has been making the headline production number unreliable as a measure of underlying strength. In contrast, manufacturing continues to post healthy gains. Nice spin blaming utility volatility – this report shows that we continue to produce little real and with utilization that low there is excess capacity that will eventually be dismantled because it’s not being put to use. As an example of that, Boeing recently sold off several of its older buildings in the Seattle area. As those buildings are taken out of production, capacity utilization rises, even if overall production declines. Inflation is heating up at the producer level for both headline and core numbers. The overall PPI inflation rate posted at a still strong 0.8 percent increase, following December's revised 0.9 percent boost and 0.7 percent jump in November. The January gain matched the median forecast for a 0.8 percent rise. At the core level, the PPI jumped 0.5 percent, following a 0.2 percent increase the month before. The market expectation was for a 0.2 percent rise. By components, food prices increased 0.3 percent, after a 0.8 percent boost in December. The energy component remained red hot, jumping 1.8 percent after surging 2.8 percent in December. The usual suspects were not behind the surge in the core rate. Nearly forty percent of the January advance can be traced to the index for pharmaceutical preparations, which moved up 1.4 percent. Higher prices for plastic products also contributed to the rise in the finished core index. The usual suspects were relatively tame. Passenger car prices dipped 0.1 percent while light trucks rose a moderate 0.2 percent. And tobacco edged up only 0.1 percent. For the overall PPI, the year-on-year rate slipped to 3.7 percent from 4.1 percent in December (seasonally adjusted). The core rate edged up to 1.6 percent from 1.4 the previous month. On a not seasonally adjusted basis for January, the year-ago the headline PPI was up 3.6 percent while the core was up 1.6 percent. Despite Fed comments to the contrary, there are signs of building inflation pressures. Riiight… food only rose .3% in the month. Note how their measurement is completely disconnected from all the other food inflation measurements that we’ve been following over the past couple of months. There is no doubt that the trend is up and that price inflation is accelerating. Continuing to pour hot money into the markets will absolutely cause commodities to rise in price. Those furthest from the production of money suffer, while those closest to it have nearly perfect trading years. Congratulations JPMorgan. Morning Update/ Market Thread 2/15 – Inflation Tsunami or Transitory Blip? Equities are lower this morning. The dollar is down, the Yen is down, Euro higher, bonds are down slightly, oil & gold higher, and most food commodities are lower with rice substantially lower. Of note is that Brent crude, at over $103 per barrel, is now roughly $18 higher than NYMEX crude. The consumer appears to be pausing after a robust early holiday season. Headline sales in January posted a moderate gain but it was largely due to higher gasoline prices. Overall retail sales gained 0.3 percent, following a 0.5 percent boost in December and 0.8 percent jump in November. The latest figure fell short of the median forecast for a 0.5 percent rise. Excluding autos, sales printed a 0.3 percent improvement, matching the increase the month before. Analysts' expected a 0.5 percent rise. A large gain in gasoline station sales boosted the ex autos figure. Sales excluding autos and gasoline rose only 0.2 percent after a 0.1 percent boost in December and 0.4 percent advance in November. The latest sales gain was led by a 1.4 percent increase in gasoline sales with food & beverage stores up 1.3 percent and nonstore retailers up 1.2 percent. Other notable increases include a 0.8 percent advance for general merchandise (which includes department stores) and a 0.5 percent boost for motor vehicles and parts. The weakest components were building materials & garden equipment, down 2.9 percent, and sporting goods, hobby, book & music stores, down 1.3 percent. Food services & drinking places fell 0.7 percent. Overall retail sales on a year-ago basis in January advanced to 7.8 percent from 7.6 percent the previous month. Excluding motor vehicles, sales were unchanged at a year-ago 6.2 percent. Consumers are pausing after a robust November as holiday sales were front loaded due to early discounting by retailers. Also, sales in January likely were softened by severe winter weather in parts of the U.S. Still, the numbers were disappointing and equity futures were down. Most of the gain is due to gasoline and things that people NEED. This gives them less discretionary money as incomes aren’t even close to keeping up with the rate of real inflation, not to mention the ridiculous and usurious interest rates that consumers are forced to pay on their debt hangovers from the mass commercial marketing season that used to be about a religious holiday. Considering the amount of inflation, that Retail Sales report is extremely weak in my view. And both Import and Export Prices jumped in January, even with our understated numbers. Still, as you read this report, compare the price jumps to that of the supposed increases in Retail Sales and you will see a large disconnect that is getting larger. Import prices rose 1.5% in January, or 5.3% year over year. While Export prices rose 1.2% in January, or 6.8% year over year! That is HUGE, and yet it is understated. It is unconscionable that the “Fed” is still pumping hot money into the system with those types of figures, but they continue to pump billions every single day! The rate of growth in these numbers is advancing dramatically. Import prices jumped 1.5 percent in January to extend a long string of similar gains. But inflation pressures continue to be isolated to energy and food where year-on-year rates are moving into the mid teens, at plus 14.3 percent for petroleum imports and at plus 14.8 percent for food/feed/beverages. These rates are up from December's 13 percent handles. The year-on-year rate for food/feed/beverages on the export side is at plus 18.0 percent. Monthly change shows a 2.6 percent rise for food/feed/beverage imports and a 3.6 percent gain for exports with petroleum imports at plus 3.4 percent. All this pressure, however, remains confined to energy and food. Prices for finished goods remain subdued showing a second straight 0.1 percent monthly gain for capital-goods imports and a 0.2 percent gain on the export side. Year-on-year, capital-goods imports are up only 0.2 percent with consumer import prices at zero. High energy and food costs are a serious burden to the public but these results won't shift expectations for low core readings in this week's producer and consumer price reports. “Subdued… Isolated… low core readings…” WHAT NONSENSE! What is clear is that things that you need like energy and food are zooming, while all the other stuff that is still ridiculously fluffed up in price due to loose monetary policy are holding steady at best. Right now the only falling prices I can see is in real estate. And this brings up probably the most important aspect of what’s wrong with the “Fed,” and again WHO controls the production of money. As they inflate and food prices zoom to all-time starvation levels, the proportion of money spent on food rises around the globe – and here in the U.S. too. Yet our measurements of inflation do not incrementally adjust to reflect that greater proportion of income spent on food. In fact the politicians do just the opposite in an attempt to make things look better than they actually are. In China, for example, just yesterday it was reported that food prices for just a ten day period at the end of January rose by a stunning 4.6%! In just ten days! That’s a 416% rate of inflation for food! I don’t know about you, but for me that crosses the line between high and hyper inflation. Stunningly, the Chinese announced that they are LOWERING the ratio of food in their inflation statistics which will have the net effect of lowering their reported inflation rate! Again, if they don’t like the results, just message the statistics! And just this morning the Chinese reported their annual inflation rate, minus food at 4.9%, citing rising rents! Food, according to them, “climbed 10.3 percent last month from a year earlier. Vegetable prices rose 2 percent, fruit prices surged 35 percent and grain rose 15 percent,” according to the statement. The rising price of food is going parabolic, with the bulk of those increases occurring recently. The Chinese report that their broadest measurement of money supply has risen 48% in the past two years! Is there any wonder food prices are zooming? While the Chinese pump massive amounts of money, the Japanese pump trillions upon trillions of Yen. The “Fed” pumps trillions of dollars, and the ECB pumps hundreds of billions. Everywhere one looks, it’s hundreds of billions here, trillions there. Again, people on the margins suffer the most as the greatest percentage of their income is spent on food. And the disinformation regarding the tsunami in food prices is at a fevered pitch. It’s the weather, global warming is changing the planet! Yes, there have been areas of locally harsh conditions for crops, but that is true every year. And even if this is an abnormal year, when you look at the charts of rising commodities, they began to go parabolic nearly 5 months ago! The charts fit the math of money pumping far more than they fit the weather pattern. The tsunami is in the supply of money – and the statistics don’t reflect the true height of the oncoming wave. Activity remains strong in the New York manufacturing region. The Empire State index rose more than 3-1/2 points to 15.43 to indicate monthly growth in general activity at an accelerating rate. Details show less strength with new orders decelerating slightly but still showing strong growth at 11.80. Shipments slowed in half but again are strong at a reading of 11.31. One reading that isn't positive is a slowing in hiring to only 3.61. Other details are mostly positive. 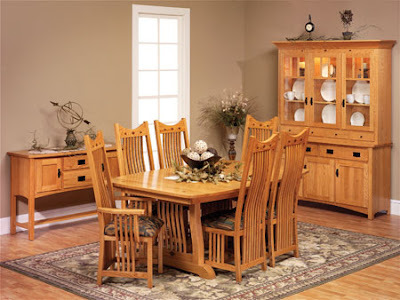 The rate of inventory build doubled in the month to 9.64 while the draw in unfilled orders was half December's rate. Price data show increasing cost pressure for inputs and solid, steady pricing power for outputs. This report hints at another month of strength, though perhaps a little less strength, for the manufacturing sector at the national level. The common thread is clear – rising input prices. And since when is rising inventories a good thing? Evidently his game plan is to woo overseas investors for his junk debt. This is so sad! Wall Street completely milked the state and now leave them to wallow in their debt, begging for international lenders (who also print their money from nothing). The really sad part is that it doesn’t have to be like this at all! The State of Illinois should create their own state bank and lend money to themselves! Yes, they can do that and they would cut their interest expense in so doing in addition to cutting the strings to the mobsters both at home and abroad. The nation's enormous national debt requires continued strong foreign buying of our financial securities. And foreigners were solid buyers in December, purchasing a net $65.9 billion in long term securities which is down from November but still right in trend. Foreign purchases of $76.8 billion in the month were offset by $10.9 billion in U.S. resident purchases of foreign securities. Foreign buying was concentrated where it needs to be most, in Treasuries. Foreigners were also solid buyers of equities and also agencies. Total net inflow, which includes short-term securities, rose to $48.2 billion in December from November's $35.6 billion inflow. Isn’t it amazing how “solid buyers” show up just where they are needed? Turns out that it's the British buying while the Chinese are selling. So, I am left to wonder how much of the money coming from London is first funneled there by our own "Fed?" We need positive $40 billion plus each month just to finance our nation’s trade deficit. But none of that matters when you can just print a hundred billion per month! There was another small movement in the McClelland Oscillator yesterday, be prepared for a large price move today or tomorrow. There is a tsunami of inflation rolling ashore. It’s unconscionable that the world’s largest countries continue to pump money into such dramatically rising food and energy prices. It’s a desperate act, and now that the spiral is set into motion, it becomes very difficult, if not impossible, for a single country to stop. They are now completely dependent on the growth in numbers. Should they stop, the numbers will fall. This is life when lived inside of the central banker debt money box. It doesn’t have to be like this. Equities are lower this morning with the dollar higher, bonds slightly lower, oil and gold up, and most food commodities higher – corn is setting another new high, as is rubber. There are no significant economic releases in the U.S. today, Tuesday through Thursday are fairly busy with PPI, CPI, housing and industrial data. Friday has no data, but is Options Expiration. The Transports zoomed over the course of two days to make it to a new closing high on Friday, thus erasing the major non-confirmation that had developed. That action was not generic in my opinion from watching the markets over many years. Of course not much of the current market action is, and I think the correlation between POMO activity and the markets is the overriding fundamental situation at the current time. That behavior is sick, it is already ending in tears for many people who live on the margins, and it will end in tears for the United States as well. WASHINGTON (CNNMoney) -- President Obama on Monday will unveil a $3.7 trillion budget request for 2012 that proposes painful cuts in many government programs but fails to address the largest drivers of the country's long-term debt: Medicare, Medicaid and Social Security. The budget takes a big bite out of domestic spending and would slash deficits by $1.1 trillion over the next decade, according to White House estimates. Two-thirds of those deficit cuts would result from spending reductions, while a third would come from an increase in tax revenue, according to senior administration officials. The cuts include slashing the funding for the low income heating assistance program. "It's a tough decision and we didn't make it lightly," White House budget director Jacob Lew told CNN's "American Morning" on Monday. "The program was never designed to meet all needs." But even as it trims deficits, the president's budget would add $7.2 trillion to the debt held by the public between 2012 and 2021. Obama's 2012 budget, which will be released in its entirety at 10:30 a.m., is sure to stoke the debate over how to get the government's fiscal house in order. Notice how the biggies can’t be touched and that the deficit would continue to grow regardless. And I guarantee you that the deficit projections in his budget stand no chance of coming in at those levels. The math is simply too far gone, our budget can never be balanced within the framework currently in place. Our deficits will simply continue to grow. Feb. 14 (Bloomberg) -- Barack Obama may lose the advantage of low borrowing costs as the U.S. Treasury Department says what it pays to service the national debt is poised to triple amid record budget deficits. Interest expense will rise to 3.1 percent of gross domestic product by 2016, from 1.3 percent in 2010 with the government forecast to run cumulative deficits of more than $4 trillion through the end of 2015, according to page 23 of a 24-page presentation made to a 13-member committee of bond dealers and investors that meet quarterly with Treasury officials. While some of the lowest borrowing costs on record have helped the economy recover from its worst financial crisis since the Great Depression, bond yields are now rising as growth resumes. Net interest expense will triple to an all-time high of $554 billion in 2015 from $185 billion in 2010, according to the Obama administration’s adjusted 2011 budget. The amount of marketable U.S. government debt outstanding has risen to $8.96 trillion from $5.8 trillion at the end of 2008, according to the Treasury Department. Debt-service costs will climb to 82 percent of the $757 billion shortfall projected for 2016 from about 12 percent in last year’s deficit, according to the budget projections. That compares with 69 percent for Portugal, whose bonds have plummeted on speculation it may need to be bailed out by the European Union and International Monetary Fund. Forecasts of higher interest expenses raises the pressure on Obama to plan for trimming the deficit. The President, who has called for a five-year freeze on discretionary spending other than national security, is scheduled to release his proposed fiscal 2012 budget today as his administration and Congress negotiate boosting the $14.3 trillion debt ceiling. Ahhh shucks… Look at Little Timmy hanging his head in shame. Darn it, that hits a banker hard right in the heart on Valentine’s Day, doesn’t it? I mean the amount of interest paid by Americans to use their own money system is shooting higher and thus the transfer of productive effort by the people into the hands of the bankers is going to increase. Ahhh, life is good… if you’re a banker. Worse than Portugal by 2016? Note that they always express these figures as a percent of GDP. This is a Red-Herring presentation designed to daze and confuse. How about comparing interest expense to our income? No, no, that would have too much meaning and would place it in the proper perspective. Instead we’re left to calculate a jump from 1.3% of GDP to 3.1%, which we know is a 138% increase from 2010 to 2016. Again, I say that these figures are drastically understated when you consider the trillions used to buy down interest rates. 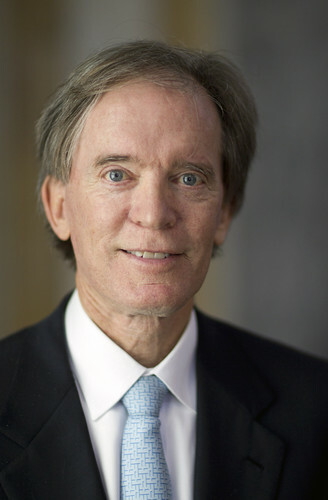 Feb. 14 (Bloomberg) -- Bill Gross, who runs the world’s biggest bond fund at Pacific Investment Management Co., reduced its holdings of government related debt to the lowest level since January 2009 while saying low yields cheat investors. Gross cut the proportion of U.S. government and related securities in Pimco’s $239 billion Total Return Fund to 12 percent of assets in January from 22 percent in December, according to the Newport Beach, California-based company’s website. He increased the percentage of cash equivalent holdings to 5 percent, the highest since April. Policy makers are robbing savers by driving down real interest rates as they keep borrowing costs at record lows in a “devil’s bargain,” Gross said in his monthly investment commentary on Feb. 2. He advised investors to reduce holdings of Treasuries and U.K. gilts and buy higher-returning securities such as debt from emerging-market nations. “Old-fashioned gilts and Treasury bonds may need to be ’exorcised’ from model portfolios and replaced with more attractive alternatives both from a risk and a reward standpoint,” Gross wrote two weeks ago. Gross is certainly one to talk about the Devil. Here’s a guy who buys worthless debt to pass off to the taxpayer while encouraging our government to "stimulate" and buy his worthless junk – his actions are one reason our interest rates and expense are going to zoom. And that makes him a two faced huckster – beware. But that doesn’t mean he’s wrong about rates – he sees the impossible math that he’s helped to create. Feb. 14 (Bloomberg) -- Ashraf Abdel-Wanis had plenty of reasons to join tens of thousands of fellow Egyptians in their successful push to oust President Hosni Mubarak. At 39, he last worked five years ago in a sugar factory and now gets by mainly on his wife’s $50 monthly salary and his mother’s pension. Now with Mubarak gone, the plight of Abdel-Wanis and the 40 percent of his countrymen near the poverty line is prompting Finance Minister Samir Radwan to develop a stimulus plan aimed at creating the jobs needed to avoid further social unrest. His plan also will need to compensate for domestic and foreign businesses that shy away from investing until the military council’s transitional rule ends. “There’s a need for a stimulus package that’s very closely related to employment,” Radwan, a former senior economist at the Geneva-based International Labor Organization, said in a Feb. 12 telephone interview. “There are at least three sectors that can do the trick: industry and manufacturing, tourism and agriculture,” he told Bloomberg Television in a separate interview aired today. The spending will probably widen Egypt’s budget deficit from last year’s 8.1 percent of gross domestic product and raise the government’s borrowing costs, according to Alia Moubayed, an economist at London-based Barclays Capital, and Mona Mansour, a research director at investment bank CI Capital in Cairo. The yield on the government bond maturing in April 2020 jumped to a record 7.2 percent last month. Policy makers may see these as acceptable trade-offs to bring down unemployment of about 9 percent, one of the sparks for the uprising. “It’s critical that once the political process is clearer, that the economy recovers in order to deliver growth and jobs,” said Mohamed El-Erian, the son of an Egyptian diplomat and chief executive officer at Newport Beach, California-based Pacific Investment Management Co. “We should not be obsessed just with the politics,” even though that’s “crucial,” he said. “We should also be thinking about what it takes to restart an economy that has been subjected to a dramatic sudden stop,” El-Erian said. Fifty dollars a month salary. Think about the doubling of price in food commodities in the past four months, and the effect that has on families like theirs. Of course narcissists don't think about things like that, and thus the daily billions in POMO continues. Egyptians should RUN from words such as deficit spending and stimulus! This is nothing but banker language designed to condition the people to get ready to accept DEBT as their savior. There is absolutely no need to incur debt when you are a truly sovereign nation, the people of Egypt must be sure to tell the bankers to pound sand! The worst thing for them would be to jump from despotism into perpetual debt servitude.